My husband holds a degree in visual communications, and although he’s a skilled photographer, that’s not how he earns a living. Instead, he chose to follow in his father’s footsteps and joined the family law firm soon after he graduated. Of his classmates, one is a well established and renowned fashion photographer today, who is sought after by the cream of the industry and makes a ton of money on each assignment (he was lucky enough to intern with a world class photographer who himself had no formal training in the subject, and from there, branched out on his own after a few years). And while most of the others are still in the photography business, their levels of success vary from low to mediocre. A formal degree is not necessary to make it big or even earn enough money in the field of photography. In this business, you need a whole lot of luck to make money on a regular basis or find a well-paying job that is not temporary. To make it as a photographer, you must be willing to follow your heart even though there may not be too many opportunities in the beginning. Be patient yet persistent as you wait for a break to make your entry into the world of photography. Not everyone who has a degree in photography continues to work in this field or finds the success they hoped for. While you do stand a chance of making it to the elite list of photographers or even earning a better than decent living, there are many drawbacks to being a photographer too, especially if you live from assignment to assignment. Your continued success depends on your reputation, so you must make sure that your work speaks for itself and that people come back to you for their photography needs and also recommend you to their friends. If you’re going into business for yourself, you must be prepared to bear the overhead costs even when you’re not getting regular work. Besides, you must also know how to manage money, find clients on a regular basis, manage your schedule, and follow up with customers. There’s more to running a photography business than just shooting great pictures. And finally, you must know enough about photo editing so that you’re able to make the necessary adjustments to the pictures that you shoot. If you need to take a course for this, go ahead, but most people pick up the technique as they go or learn from tips and tutorials on the Internet. Photography has been rated among the top 200 jobs for 2010 by Careercast with a starting salary of $17,000, midlevel salary of $29,000 and top level earnings of $62,000, so if you think it’s your cup of tea, go ahead and choose a career in this field. 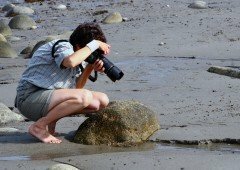 This article is written by Kathy Wilson, who writes on the subject of Photography College . She can be reached at her email id: kathywilson1983@gmail.com.